Ahuman rights lawyer has been sentenced by the Iranian authorities to 11 years in jail for crimes that include “activities against national security” and “propaganda against the regime,” family members confirmed Monday, January 10 , 2011. In addition to her jail sentence, the lawyer, Nasrin Sotoudeh, was barred from practicing law and from leaving the country for 20 years, her husband, Reza Khandan, said in a telephone interview. Ms. Sotoudeh said she was told by her interrogators that her sentence was guaranteed to be more than 10 years, Mr. Khandan said, leading her to believe that the ruling against her was politically motivated. Mr. Khandan said that five years of the sentence were for accusations that Ms. Sotoudeh was a founding member of the Defenders of Human Rights Center, an association of lawyers led by the Nobel Peace Prize winner Shirin Ebadi, who left Iran in the aftermath of the disputed 2009 presidential election and subsequent crackdown on opposition figures. “While membership in the center is not in any way a crime, she was, in any case, not a member,” Mr. Khandan said, adding that his wife's defense lawyers would appeal the sentence. Two other lawyers, Mohammad Seifzadeh and Mohammad Ali Dadkhah, have been convicted of similar charges in connection with their roles as founding members of the center, which the Iranian authorities were reported to have closed down last month. Mr. Dadkhah was released on bail in September after more than a year in prison, while Mr. Seifzadeh was sentenced in October to nine years. The Iranian authorities have often accused human rights lawyers of colluding with foreign governments to undermine the country's Islamic government. 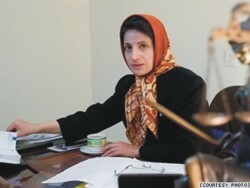 Most recently, Mohammad Mostafaei, a lawyer representing Sakineh Mohammadi Ashtiani, an Iranian woman convicted of adultery and sentenced to death by stoning, fled to Norway after coming under pressure from the authorities after he helped expose Ms. Ashtiani's case to the international news media. A second lawyer for Ms. Ashtiani, Javid Houtan Kian, was arrested in October and remains in Iranian custody.